Kaifi aur main ("Kaifi and I") is not a film; it's a play of sorts. Still, it seems to deserve a spot here at Filmi Geek, since it features my most favorite actress Shabana Azmi and her husband, filmi screenwriter and songwriter Javed Akhtar, in a series of reminiscences about Shabana's parents. It was because this show was in town that I was lucky enough to meet Shabana Azmi. Nothing could really top that experience, but nevertheless the show was wonderful. Kaifi aur main was adapted by Javed sahib from the writings of Shabana's parents, Shaukat Kaifi (a stage actress who also played the madam Khanum in Muzaffar Ali's Umrao Jaan; Shabana reprised her mother's role in the 2006 adaptation) and Kaifi Azmi, the revered Urdu poet and central figure in India's progressive writers' movement. Shabana and Javed read the texts, poignant tales and funny tales from Shaukat and Kaifi's life together; Javed recited many exemplars of Kaifi's poetry; and an excellent singer named Jaswinder Singh performed some of Kaifi's filmi songs. The stories were told more or less chronologically, as far as I could tell, beginning when Shaukat and Kaifi met as students, and carrying through to Kaifi's death. There were delicious excerpts from the love letters Kaifi wrote to Shaukat before they were married. There were also tales of the sparkling, stimulating meetings of members of the Progressive Writers' Movement, and some distressing periods when Kaifi was under some scrutiny for his associations with Communist party in India. If my description seems a little vague, it is only because my comprehension was a little vague. The show was entirely in Urdu, and today just 18 months into my study of Hindi-Urdu my aural comprehension skills are not quite up to the level that Kaifi aur main demanded. For the most part I knew what was being talked about, but I did not always entirely know what was being said about it. When the pace was slow - at the beginning of the show and in some of its sadder moments - I followed very well, but as the pace accelerated I could not keep up. I couldn't understand any of Javed's funny stories, which was too bad, because the audience seemed to love them. The final segment, though, began with Shaukat's lament upon Kaifi's death; I understood it completely, and I burst into tears, because, well, Shabana Azmi is a pretty good actress. Indeed, the tasks were divided well; Javed - the writer of the couple - told the funny stories and gave the poetic recitals, while Shabana the actress did the emotive heavy lifting, as the stories assigned to her tended toward the poignant. Kaifi aur main is scheduled for many more dates in the United States; these are listed on the show's website, so I do encourage you to consider catching it if it's coming to your town. The picture above is one I snapped of Shabana and Javed from my front-row seat; here is another that I took, of Jaswinder Singh and his band. 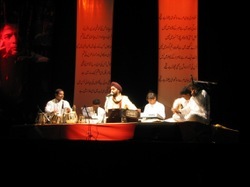 At the left-hand side of this picture you can see the stylized portrait of Kaifi Azmi that formed the centerpiece of the stage backdrop.